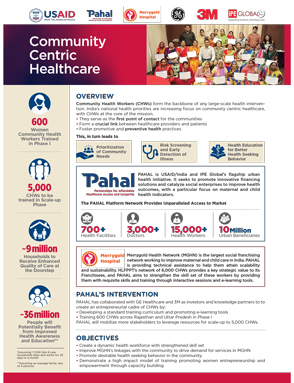 PAHAL has collaborated with GE Healthcare and 3M as investors and knowledge partners to to create an entrepreneurial cadre of CHWs by developing a standard training curriculum and promoting e-learning tools, training 600 CHWs across Rajasthan and Uttar Pradesh in Phase I. PAHAL will mobilize more stakeholders to leverage resources for scale-up to 5,000 CHWs. PAHAL - Comunity Centric Healthcare seeks to create a dynamic health workforce with stregthened skills set. Improve MGHN's linkages with community to drive demand for services in MGHN, and promote desirable health seeking behaviour in the community.